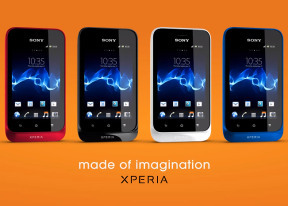 The Sony Xperia tipo has quad-band 2G and dual-band 3G. Mobile data speeds are boosted by 7.2Mbps HSDPA and 5.76Mbps HSUPA. Local connectivity is covered by Wi-Fi b/g/n, and there's also Bluetooth 2.1 with A2DP on hand. The tipo comes with Sony's Smart Connect manager, which can be set to perform certain actions whenever a accessory is connected, or during certain times of the day. For instance, you can set it to start the music application whenever headphones are plugged in, or set the phone to silent at night. One of the biggest advantages that the Sony Xperia tipo gets from running Android ICS is the updated web browser. This browser has a streamlined interface, incognito browsing and other cool features. The browser interface is quite minimalistic; all you get is a URL bar with a tabs shortcut. Hitting the Menu key gives you more options - Refresh, Forward, Save to bookmarks, Share page, Find on page, full settings and a couple of more - Request desktop site (no more hunting for that "Desktop" option buried at the bottom of the site) and Save for offline reading. The other trick is Incognito mode - there's no global setting, but you can open individual Incognito tabs. Speaking of tabs, the tab switching interface looks exactly like in the Recent apps list. You can even close tabs by swiping them off the screen. Quick controls (available from the Labs settings) reveal five controls (New tab, Tabs, URL, Bookmarks, More) when you slide your finger in from the side. Those really improve the browser experience. Another cool feature from Labs is Full screen, which squeezes out a little more screen real estate by hiding the status bar. Flash support on the tipo browser was a mixed bag. YouTube videos were able to play in the browser window, but the experience was far from smooth. Most Flash ads showed up as well, although Flash games did not run. You may be able to side-load the Adobe Flash apk if you find it from the dev forums but just don't count on in running trouble-free. The Sony Xperia tipo comes with a solid set of organizing options, including a document viewer. The app in question is the OfficeSuite viewer and it has support for viewing document files (Word, Excel, PowerPoint and PDF, including the Office 2007 versions). If you want edit as well as view, the Pro version (a $15/€13 update) can do that. Reading documents is reasonably comfortable and panning is blazing fast. There's built-in file browser and cloud storage integration (Google Drive, Dropbox, Box and SugarSync). Finally, the Sony Power Saver app lets you automate certain power saving functions for your device, such as whether to dim the display or disable certain connectivity features when the battery falls below a certain level.